LCM tailors each portfolio to our clients’ individual goals and circumstances. Our client’s asset allocation choices provide the framework for the portfolio. As such, Lewis Capital works closely with each client to determine the optimal mix of equity and fixed income assets given the client’s objectives and current financial situation. Not only does LCM spend several hours with each client upon the onset of the relationship, but we stay in touch with clients regularly to ensure the clients’ portfolios remain aligned with their circumstances and reflect any life changes. 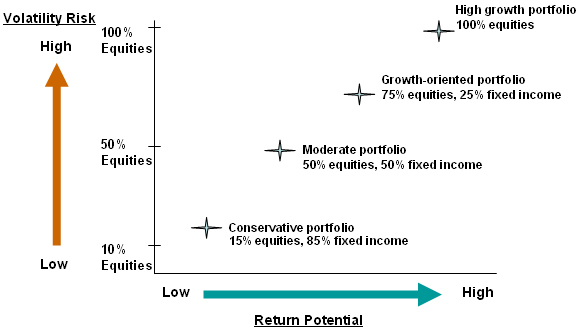 The chart above illustrates some typical asset allocation targets for balanced portfolios and the risk/return profile associated with each.